Did you know, it took over 500 millions years for nature to develop a perfect fish tail for energy transmission in the water? 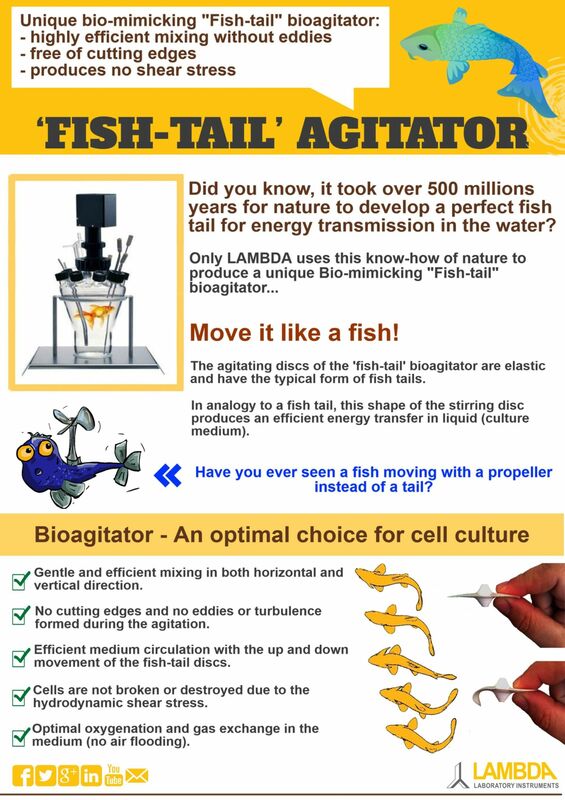 The agitating discs of the 'fish-tail' bioagitator are elastic and have the typical form of fish tails. In analogy to a fish tail, this shape of the stirring disc produces an efficient energy transfer in liquid (culture medium). Have you ever seen a fish moving with a propeller instead of a tail? Gentle and efficient mixing in both horizontal and vertical direction. No cutting edges and no eddies or turbulence formed during the agitation. Efficient medium circulation with the up and down movement of the fish-tail discs. Cells are not broken or destroyed due to the hydrodynamic shear stress. Optimal oxygenation and gas exchange in the medium (no air flooding).